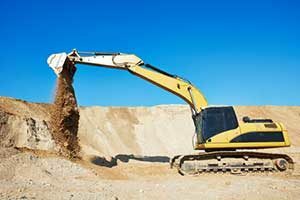 Dirt Connections offers a number of residential dirt grading, demolition, site preparation, and excavation services. We have the tools and expertise to do the heavy lifting on your next project, no matter how big or small. When starting a new project on your property or in your home, it may first be necessary to clear out old structures, housing components, or interiors. Dirt Connections’ team of contractors have years of experience exercising the care and quickness you require to get your project off the ground and avoid unnecessary damages or delays. We have the tools and know-how to remove what you don’t want, leave what you do, and clean-up the mess when we’re done. Preparing a site for a construction project requires expert foresight and consists of a number of different tasks. First and foremost, the area will need to be marked, or “rough staked”. Rough staking can be completed by the home or property owner, but may be best left to an expert who is familiar with placing a new structure on a lot, and can consider how it will fit with the site and any existing natural/man-made characteristics. Once the rough staking is complete, the construction area will need to be cleared of any debris including any trees or foliage. If the property or homeowner wishes to leave any existing trees or site features intact, this should be considered during the rough staking of the new structure. Once the site is cleared, Dirt Connections’ team can begin rough grading the site for construction, flattening out the area or creating a specified slope in accordance with the project’s desired specifications. 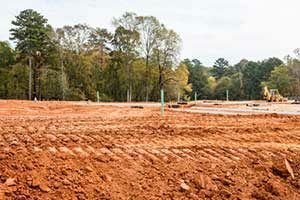 Once the project site is staked and cleared, Dirt Connections can begin excavating the area to accommodate any below-grade components, such as a swimming pool or basement. In order to save time and money, it is important to keep a balance between the amount of dirt that will need to be removed and the amount of dirt that will be used to fill in areas, this is also known as “cut and fill”. An even cut/fill balance will help keep costs down by avoiding the need to haul away large amounts of dirt. When grading the site we will use the dirt displaced by excavation to create a uniformly flat or sloped space to work on. Residential dirt grading should be done carefully to ensure the site has proper drainage, and a sturdy area for concrete components, such as driveways and foundation. Rough grading will take place at the start of the project to make it easier to navigate the site. Once construction is complete, grading will be finalized to fine-tune site drainage and to take landscaping considerations into account. Although you will not be able to completely stop soil erosion during construction from rain and water runoff, our experts can help limit it. Limiting erosion during construction, and after the project is completed is essential to maintaining the integrity of your project, and ensuring the effort spent grading the site is not wasted. Dirt Connections’ team of experienced contractors are ready to assist you with your next project. We offer a wide variety of site preparation services and can adjust to the demands of any project. From residential dirt grading to water and erosion control, to foundation excavation, Dirt Connections is here to help. Contact us today to find out how we can make your dream project a reality!